Following on from my video review of the gorgeous Halo Hair Extensions I wanted to show you how I dyed mine.If you haven't watched my video review then you can catch up here! I will just quickly recap about the extensions for those of you who haven't yet watched the video. I have the Dark Brown 20" set which comprises of 8 pieces, each piece is known as a weft, each weft has super smart clips which attach to the root of your hair. Depending on the size of the weft depends on the number of clips. I've taken some photos to show you the wefts so you can size the width of them as well as the colour. The clips need to be open in order to attach to the root of your hair, once in place you snap them shut. If you follow my blog then you will know a little while ago I dyed my hair red, which at the time I loved. However after a few weeks I soon lusted after my brunette hair again and so took the plunge and dyed my hair a very dark brown hoping to mask as much red as possible. Well if you have or had red hair before then you'll know red hair can be a bugger to get rid of, but I do like my shade I think the red adds warmth. To look at my hair you would think its just a dark brown but believe me when I stand in the sunshine my hair looks really red. 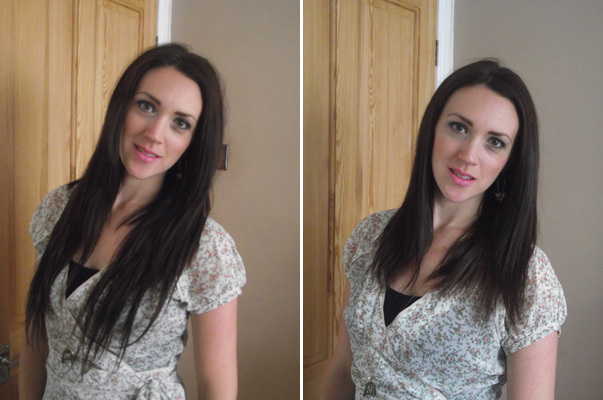 With the help of the lovely Mel I soon transformed my Halo locks to match my hair perfectly so ALL credit goes to Mel. You can follow Mel here and see her great post. With the help of Mel's amazing post showing you how to dye your hair extensions I was ready to go. I must admit it's pretty scary at first if you've never dyed extensions but really worth it. I picked a Semi- permanent dye by L'Oreal in the colour Black Cherry. I got all my tools together and set up a station in my kitchen. 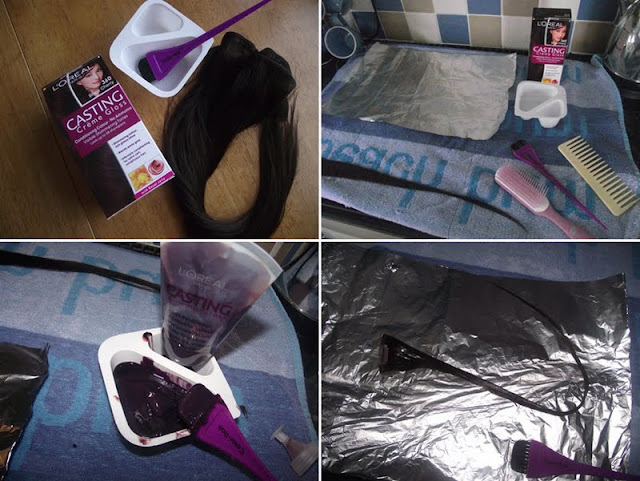 I used an old towel which I use for dyeing my own hair, I got a strip of foil which I used to dye the extensions on and then a mixing pot which is in fact a yogurt pot. It's all about being green peeps! Once I made up my dye I tested the colour on one of the single wefts, you're meant to leave the dye on for half the usual time when dyeing your natural hair. Casting Creme gloss says roughly 15-20mins depending on Grey. At first I left it on for 5 mins and then checked and then decided on 6 mins which was perfect timing. I used the timer on my cooker which helped lots, you can use your phone or a watch. I only dyed 2 wefts at a time and then rinsed them under the kitchen tap in cool water till it ran clear. Then carried on dyeing the rest of the wefts. Once they had all taken and where clean of dye I then used all the conditioner which came with the dye and smothered the extensions in conditioner then combed this through. I left the conditioner on for a good while probably 15mins and then again rinsed them all thoroughly and set them out to dry. I found that laying them out on a towel and then brushing them on the towel separated the hair strands evenly so they dried much quicker. Once they where dry I sprayed them with heat protectant and was good to go. I can not stress enough that the quality of these did not change, they stayed just as beautiful as when I first opened them up! I must say I look quite young in these photos! I hope you found this post helpful and if you need any help please leave a comment and I will try and help as much as I can. Make sure you follow Halo Hair Extensions on Twitter and Facebook because they are often having great giveaways which are NOT to be missed! Have a look at their website and see their accessories, I have my eyes on the stunning feathers. The VERY lovely Halo Hunnies have given my readers an exclusive code which will give you 10% off any Halo, just enter sherriehalo in the code section for your discount to work. Enjoy! You look great and those extensions are so natural!